"Here at NASA, we all pee the same colour." 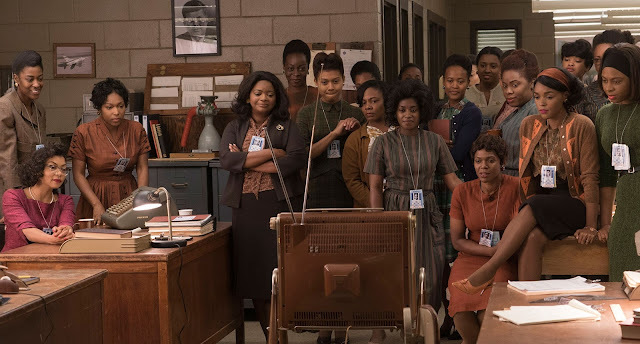 Hidden Figures tells the true story of three female African-American mathematicians (or human "colored computers") and their essential role in successfully executing the 1960s manned space program at NASA during the early days of the space race set against the backdrop of segregation. Co-writer/director Theodore Melfi has assembled a very pleasing if entirely conventional film based on the non-fiction book by Margot Lee Shetterly. Taraji P. Henson stars as Katherine Johnson alongside Octavia Spencer and Janelle Monáe as Dorothy Vaughan and Mary Jackson. These three women and many of their black female colleagues were the ones responsible for putting a man into space through their hard work calculating equations, engineering solutions, and programming brand new IBM processors at the time. In 1961, the U.S. was lagging behind the Soviet Unions's space program because of their failure to mobilize women and non-whites by restricting their advancement and educational opportunities to the detriment of entire space program. 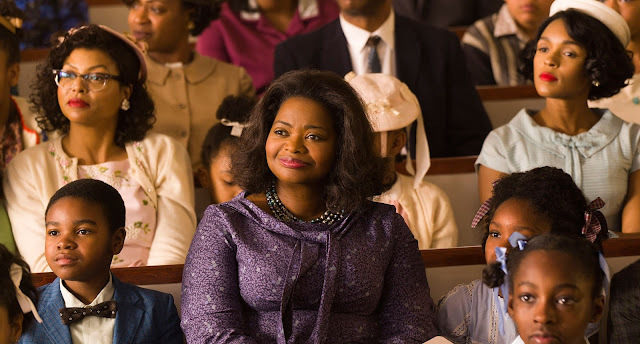 Characters constantly reiterate how there is simply no process by which women or people of colour could advance in the NASA hierarchy, because the training, education, or paths were institutionally put outside of their reach. Henson is splendid embodying quiet strength and fortitude as a someone simply trying to do her job and achieve the same goals as everyone else in the face of needless obstacles. Spencer hits home as the faithful worker bee crushed by the system that refuses to acknowledge her work. Monáe as Jackson is easily the liveliest and most combative yet she's still full of conflicted struggle as someone trying to overcome her gender and skin colour. The central premise of the film and book revolves around the slowness or inability to execute big American dreams like space travel when the painful realities of racial and gender discrimination limits the possibilities on the ground. The impossibility of space travel is compared over and over again to the perceived impossibilities of equality. Civil rights and institutional sexism are as implicitly addressed as possible using basic logic to argue its points within the film. Somehow, illogical practices like segregated research facilities and bathrooms were able to persist in a place like NASA. The notion of American aspirations for space travel was a uniting element of society transcending race and gender is also fairly well executed thematically. The entire film is a practical argument against racism, sexism, and segregation in the workplace. Furthermore, Kevin Costner as Al Harrison, director of the Space Task Group, plays the clueless boss represents the white guy in charge who somehow doesn't realize how racism works quite sublimely. Costner is still somehow perfectly suited to play the well-meaning 1960s American historical public figure behind the scenes to a tee. Co-written by Allison Schroeder, the script is fluid and economical in its efficient storytelling including a minor but effective office antagonist in Kirsten Dunst, Mahershala Ali as the handsome love interest, and the endlessly charming Glen Powell as astronaut John Glenn who continues to embody cool. Jim Parsons is also frustratingly watchable as an unrepentant jerk who seems to relish impeding Johnson at every turn. Henson, Spencer, and Monáe make for an entirely winning combination of talent. Melfi has put together a truly crowd-pleasing assortment of actors and material for an entirely uplifting, inspirational story of the lesser known figures who broke barriers of race and space. It's both appealing yet frustrating what a nice and neat package a contemporary white male filmmaker has put this little known historical story into. Hidden Figures is easily one of the most polite cases against the normalization of white supremacy ever put to screen.